Need some rainbow theme ideas? 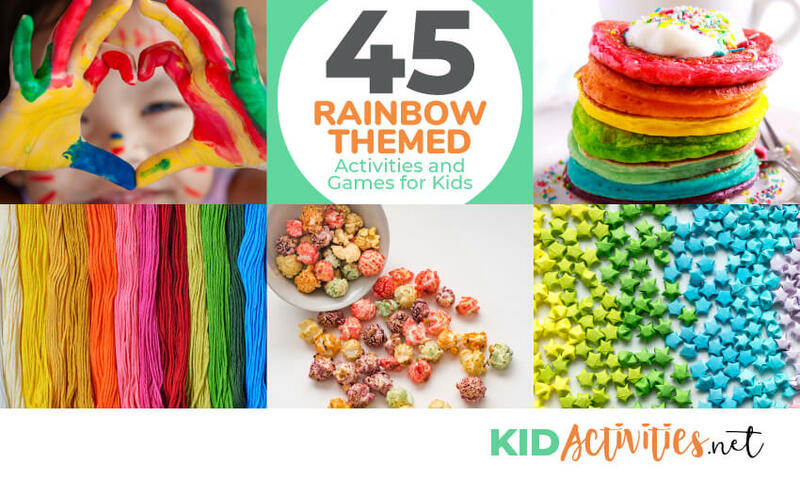 These rainbow themed game and activities for kids will do the trick. Great for kids parties or classroom ideas. One of the most magical sights in nature is a rainbow! Music and poetry have addressed the beauty of this phenomennom. Is it any wonder that it is such a popular theme for children’s classrooms and programs? There are many ideas that are geared to younger children in this category; however, there are also suggestions for school-age youth. 1. RAINBOW TAG VARIATION #1 : Great fun for older kids! To prepare, hide each tongue depressor along with the matching color of face paint in a different place around the play area. Next, choose someone to be “Pinkie”, the player who sneaks around trying to tag the other players and undo their progress. Give Pinkie something pink or rainbow-colored to wear. To play, set everyone but Pinkie out in search of the sticks. Each time a player finds one of the colored sticks, he should discreetly — don’t give away the location to the others! — paint a stripe on his face, then leave the stick and paint in place. Bluffing is encouraged to keep the locations secret. The catch: Pinkie will be lurking, trying to tag the players. Every time she does, she wipes off one of their stripes. The first player to get one stripe in each color wins. 1. Choose a ‘rainbow catcher’. They will stand in the middle of a large play area. 3.The rainbow catcher then calls out a color. All the players that have been assigned that color try and run past the catcher to the other side of the play area. The ‘rainbow catcher’ tries to tag as many of children as they can before they reach the other side. 4.The kids who are tagged become rainbow catchers and stand in the middle to help tag other players on the next round. The rainbow catcher can yell “Rainbow!” and all the players must try and reach the other side. The last person caught becomes the new rainbow catcher. If you’re playing with a large group-have more than one ‘catcher’. You say, “If I found a pot of gold at the foot of the rainbow, I’d buy this…” Then you show by acting out what you would buy. The others try to guess what you bought, and the first one to guess becomes the new actor. Have a TREASURE HUNT and hide the treasure in a POT OF GOLD– to be shared by everyone once all the ‘rainbow themed clues’ have been found. 1. Spread out different colored paper circles. 2. Children step on each circle as the music is playing. 3. Once it stops, the child on a certain color can get a prize. We see rainbows during rain showers when the sun is shining on raindrops. Rainbows appear in the part of the sky that is opposite of the sun. The closer we are to the rainbow-the brighter it appears, Rainbow colors are always the same in order: Violet, Dark Blue, Blue, Green, Yellow, Orange, Red. Everyone who looks at a rainbow sees it differently. #1 Idea: Using colored construction paper of yellow, orange, red, blue, green and purple traceCHILDREN’S HANDS. Make about 10 hand prints of each of the colors of the rainbow. #2 PAINTED RAINBOW Make a huge hand print rainbow using different colored finger-paint; use white butcher paper as the background. Have kids dip their hands in one color and print a few along one row. Ask children to wear clothing of each color of the rainbow or dress in a solid color of just one of the rainbow colors. You could also declare ‘RAINBOW DAY” and all wear as many colors as possible! 6. Mix and match plates, cups and napkins in rainbow colors. 7. Face paint a small rainbow on the cheek of each child. 8. Attach a large cardboard painted rainbow to the room’s front door. 10. Read the ‘Rainbow Fish’ books. Make rainbow fish by decorating and putting sequins on cut out fish shapes. 11. Purchase some rainbow colored ‘slinkies’ to slink down some stairs or steps. 12. Hide crayons of each rainbow color for the children to find. As each crayon is found, color in a previously drawn arc on a big piece of paper. (Children group color parts of the arc) Once the rainbow is complete, everyone could get a treat for great ‘team’ work! The rainbows that we see in the sky are caused by a reflection of the sun’s rays in drops of rain. There are also other ways to view a rainbow with the help of water and a few other supplies. 1. Fold the coffee filter into half. 2. Fold it again one more time. 3. Draw a dark green line about one inch (2-3 cm) from the round edge of the filter. (Be sure to save room for a black line next to it). 4. Proceed to draw a dark black line one inch (2-3 cm) from the other side of the round edge. (Do not let the lines touch each other). 5. Make the filter into a cone shape by securing the edge of the paper filter with the paper clip. 6. Place water in the saucer. 7. Put the round edge of the filter in the water. 8. Let the filter stay in this position for one hour and then observe the results. 9. Now, explore! Pay close attention to what happens to the dark green line. Record your observations and explain what you think is happening during this experiment. White paper, watercolor paints or crayons. 1. Fill a glass or clear jar with water to the top. 2. Set glass/jar on window sill in bright sunlight. 3. Glass or jar should stick out over the ledge just a little bit. 4. Place a white piece of paper on the floor in front of the window (tape 2 or 3 pieces to form a poster size and obtain a bigger rainbow image). 5. A rainbow will be captured/reflected on the paper. This will greatly depend on how bright the sunlight is and the positioning of the glass jar, so move the jar side to side on the window sill to help the process until you see the rainbow reflected on the paper. 6. Quickly draw lines to capture the rainbow and children can paint directly on the paper in the floor as the rainbow is reflected there. 1. To create an indoor rainbow fill a glass pan with water and place a mirror in the water so that it is leaning against the edge of the pan. 2. Completely darken the room and shine a flashlight on the mirror. 3. Carefully adjust the angle of the light until a rainbow is reflected on a wall or the ceiling. Make a giant rainbpw by painting a large sheet of paper with water; Add big arcs of color (red, orange, yellow, green, blue, violet). The colors will slowly blend into each other. 1. Remove the wrappers from rainbow-colored crayons: Red, orange, yellow, green, blue, and purple. 2. Have children use the sides of the crayons to draw rainbow arcs on paper. 3. If the weather is good, invite them to make rainbows on a sidewalk with colored chalk. 19. TAPE SIX DIFFERENT CRAYONS in a straight line. Show children how to draw a rainbow with one stroke. FIRST IMAGE-you will need: Fruit cereal, glue, paper, cotton balls and markers. 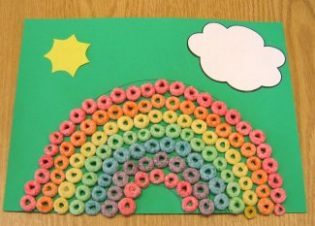 Glue rainbow colored ‘froot-loop’ type cereal on construction paper in the SHAPE OF A RAINBOW! When complete add the cotton clouds and a sun. Butcher paper (Roll paper), several different colors of yarn, construction paper that matches yarn colors, glue, crayons (Optional). On pieces of butcher paper, draw arched lines to represent rainbows. Put glue on the rainbow lines and have children place a piece of different colored yarn along the entire length of each line. Have the children tear the colored paper into pieces, one color at a time. Then have them glue the torn paper onto the area between the pieces of yarn, under the yarn for that color. Encourage children to fill the entire space with the appropriate colored paper pieces. You may want to color a portion of each space with a crayon to help. Using rainbow shaped paper and rainbow colored yarn, the children can make rainbow yarn collages. 1. Using the templates, trace and cut out one rainbow and 2 clouds. 2. Have children decorate both sides of the rainbow with watercolors. …..Set aside to dry. 3. Glue the clouds to each end of the rainbow. 4. Cut brightly colored tissue paper into 1/2″ strips. 5. Have the children glue the tissue paper strips to the clouds. 6. Glue cotton balls onto the clouds. 7. 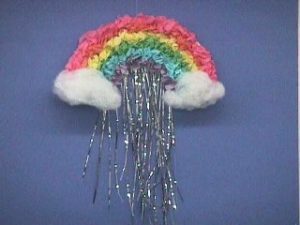 Attach yarn to the top of the rainbow to hang and display. 2. 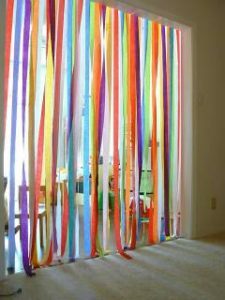 Cut long pieces of red, orange, yellow, green, blue, and purple crepe paper streamers; each streamer should be about two to three feet long. 3. Staple a rainbow of streamers onto the paper plate. 1. Cut a paper plate in half. Cut an arc from one half of the plate..
2. Cut tissue paper into 2″ squares from the rainbow colors. You may use either pastels or a variation would be to use bright colors (red, orange, yellow, green, blue and purple). Each color takes approximately 30 squares to completely cover a row. 3. Roll each square into a ball or pinch the enter of the square and gather the tissue into a point and glue to the arc. Keep each color in its own row. 5. For clouds, glue cotton balls or fiberfill to each end of the rainbow. Arrange buttons on the paper in the shape of a rainbow and then paint the buttons in broad stripes of color with the paints. Let buttons dry to have a nice button rainbow. Dye stringable pasta in batches of red, orange, yellow, green, blue, and purple. For younger children: Sort and count the pasta pieces by color. Place or glue the pieces on matching colored paper. The Rainbow Connection by Paul WIlliams and Kenneth Ascher and featured in the first Muppet Movie. Sung by Kermit the Frog. Over the Rainbow from The Wizard of Oz. I Can Sing a Rainbow: A children’s song used to teach them the names of the colors. Look to the Rainbow from Finian’s Rainbow. Teach the the colors of the rainbow while making and eating delicious snacks! 2. Place portions of pudding in 3 containers. 3 Add food coloring and make one red, one blue, and one yellow. 4. Have the children mix the colors to see what other colors they create. Another variation is to add some colored fruited ring cereal to your pudding. Simply eat colored fruit ring cereal. This idea originated with Amanda Rettke at IamMommy…Wonderful fun!!! In one large bowl, make pancake batter following recipe directions. Separate the batter equally into several smaller bowls. 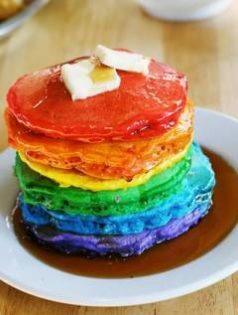 Make pancakes as usual…that’s it! This is another one your kids will always remember you for! 1. Take a piece of yarn or long licorice string candy (as in image to the left) to go around child’s neck or wrist. Make Rice Cereal Treats (Rice Krispy treats) and color it with your favorite food coloring (or use two or more colors). Eat colored marshmallows or add to Jello or pudding…use as decorations on frosted cupcakes or cookies. Spread frosting on a graham cracker. Sprinkle on colored sugar… All kinds of rainbow frosted cookies. 1. Heat oven to 300°F Line a 15x10x1-inch pan with foil or parchment paper. 2. Place popcorn and nuts in large bowl. 3. Heat butter and syrup in small saucepan on low heat. 4. Stir in sugar and gelatin. 5. Bring to boil on medium heat. 6. Reduce heat to low; gently simmer 5 minutes. 7. Pour syrup immediately over popcorn, tossing to coat well. 8. Spread popcorn in prepared pan, using two forks to spread evenly. 11. Remove from pan and break into small pieces. 1. Stir 1 1/4 cups boiling water into each flavor of gelatin in separate bowls until completely dissolved. 2. Pour each flavor into separate 8 or 9″ square pans. 4. Cut each pan into 1″ cubes. 5. Arrange rows of different color gelatin cubes to form a rainbow on a large flat tray or cookie sheet. 6. Place 1/2 of the cool whip at each end of the rainbow to form clouds for dipping. You can also make ‘RAINBOW JELL-O’ by setting each layer before adding the next layer. Use a glass bowl or set in clear plastic cups so that the colors show through. Carefully cut arcs out of a round cake; reassemble and frost in each color of the rainbow. 39. CUPCAKES iced/frosted in different colors and topped with colored sprinkles. Cut all pieces of fruit into small pieces. Put out in bowls and children can choose what they like (give instructions as to HOW MUCH they can take) Mound on plates to make a tall mountains. Top with yogurt. Sprinkle with nuts. 2. Using a teaspoon, swirl the colors onto the pretzel rods or shapes–until you achieve your desired ‘rainbow’ result. 3. Sprinkle on rainbow jimmies before the candy melts dry. Note: Even though the melts will be pastel colors of pink, blue, green or yellow -the flavors will all be vanilla. IDEA: Cut SANDWICHES into rainbow shaped arcs. IDEA: Make ICE CUBES of different colored fruit juice — place them in clear colored drinks. IDEAS: MAKE KOOL-AID OR SPRITE (with a little food coloring) in the primary colors of red, yellow and blue in three separate pitchers. With these colors you can mix drinks for kids in any color of the rainbow. NOTE: Green = yellow + blue, Orange = red + yellow, Purple = blue + red. A craft and snack in one! 1.Depending on group size-As a guide, fill bowls with about 3 ounces of milk and add 2 to 3 drops of food coloring. 3. Toast in toaster or toaster oven. 4. Butter and sprinkle cinnamon if desired. For young kids, explain that this is safe to eat because it is NOT real paint! Also, for theme days, you can cut the bread with cookie-cutter shapes before it is painted and toasted. Kids love spontaneous fun days at school, day-care or home! Pick a theme and go with it…just for fun! Your children will love you for it! Solid color bags in all the colors of the rainbow – tie a pretty rainbow ribbon on the top. Small black pot or container to represent the pot of gold at the end of the rainbow. Tie party favors up in solid or rainbow colored bandanas or squares of fabric.